The final, official MotoGP test before the start of the 2018 series in two weeks has come to an end. 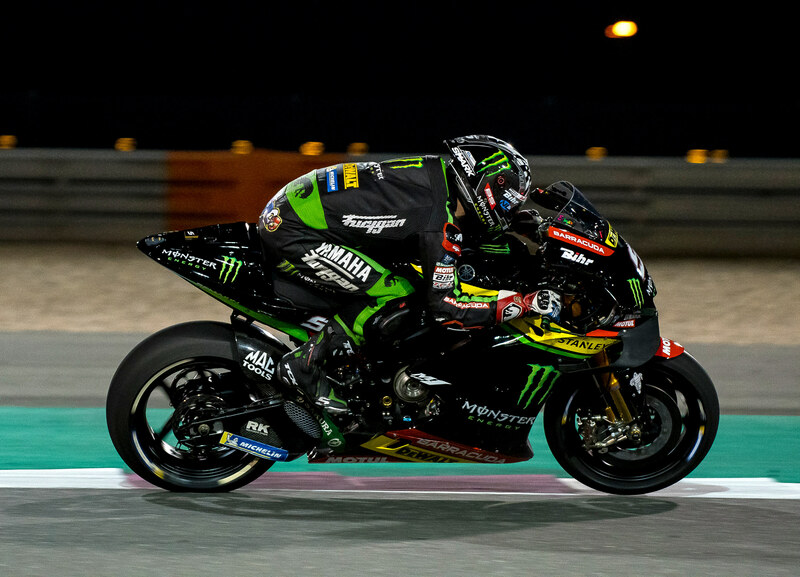 After three days at the Losail Circuit, Johann Zarco (Yamaha) posted the quickest lap time (by some margin), coming close to the outright lap record at the circuit (held by Jorge Lorenzo when he rode for Yamaha). Yamaha riders had 3 of the 5 quickest times … with Valentino Rossi and Maverick Viñales slotting in at the number 2 and 5 spots, respectively. Overall, however, this final test demonstrates remarkable parity among several teams and riders, including Suzuki (which occupies the number 6 and number 8 spots with Andrea Iannone and Alex Rins) among several fast Ducatis and Hondas. The coming season could be quite interesting, as a result. Take a look here for the combined, best lap times over the three-day test. What I see is several companies making machines to be ridden by riders who are themselves becoming part of the machine equation. You have twelve meat bags on machines from four different manufacturers all within a one second lap time window. The most machine-like meat bag wins the race. Is it any wonder that Yamaha thinks that they can build a robot rider? The least consistent part of the machine is the meat bag. So get rid of that. Are you arguing for an elimination of electronics in motoGP? I guess they could, but racing is faster yet safer than just a few years ago and the technology is being readily transferred to road bikes. It even includes the airbag race suits – look how many “offs” don’t injure riders. You could still get rid of the GPS based rider controls. I lost interest in the series when they shoved the darn four strokes down everyone’s neck. But I look under the hood once in a while to see what other mischief they are up to. For the fans, the series should provide close racing and a good season long struggle for the title. As a guy who races from time to time. I am not so enamored. They have effectively killed the aliens by making everyone an alien, or meat bag. The same bikes that are making slower guys faster are limiting how fast the fast guys can go. It might make a better TV show. But you’ll seldom see anyone have a truly brilliant race or clearly dominate a season. A would be hero will be just another meat bag. Agree with you Mick. I am rapidly loosing interest in MotoGP. It looks impressive when you see the incredible lean angles and the long black lines they leave out of corners, but when you realise it is done by computers it becomes meaningless. It wouldn’t be much more boring than it already is if they eliminated the riders and it was all done by robots. Better still, scrap the whole series and replace it with something that is real. But as MotoGP has now become a money making enertainment business instead of a true sporting competition they will continue to ‘milk’ it for as much as they can for as long as they can. When you watch Marquez use his knee and elbow to save a certain crash you will realize it’s not computers totally running the show. If it was all up to computers, all the bikes would cross the finish line at the same time as they would be programmed to run perfect laps. Grand Prix racing has always been a money-making entertainment business instead of a true sporting competition, and, yes, they will continue to milk it for as long as they can, just as they always have. Mickey, it just isn’t as impressive as it looks. It isn’t totally real like it was when Rainey, Schwantz and Doohan were racing. You may still think it is exciting, but I am getting bored with it. If it was all up to computers they wouldn’t all cross the finish line at the same time. It would be a contest to see who could make the best race bike with the most advanced electronics, unless restrictive regulations made all of the bikes the same. In fact, it could rapidly advance the development of electronics. But it would still be boring like it is now. Scrap the whole series and replace it with something interesting. Looking under the hood once in a while is clearly not sufficient to have any sort of clarity re: what MotoGP is about these days. Mark Marquez is the most dominant MotoGP rider of recent times, having immediately joined Agostini and Rossi at the top of that list at the age of 24. He’s been in the class for five seasons, and has won the championship four times. The time he didn’t win, he was 3rd. He had the best bike the first two years, and what was clearly not the best bike for the last three. On a side note, I love two strokes too, but there’s no relevance there…had to go. Also, moreso than in any other motorsport, the technology being developed in motogp is being applied directly to road-going models. I have to disagree with you. The tech makes everyone faster, slow and fast guys alike. The fastest guys are still the fastest, and the slowest still the slowest. The final two stroke years (particularly the Doohan era) were desperately predictable and dull. The last 3 years, in particular, of MotoGP have been thrilling. Can you see the engines running? I felt that GP needed a displacement increase toward the end of the nineties. Chassis and tire technology forced companies to push the engines too hard. 400 horsepower per liter NA engines is asking a bit much. You will NEVER sell me on the four strokes. If it’s not a two stroke, it’s not a race bike. End of story. If you are wondering. I have three of them. One thing I’ve learned about testing is that it doesn’t really say much about what the races will be like. Some guys are shooting for the clocks, some are working on race pace, and some are still experimenting. Still, it is good to see Suzuki at least making a show of it. Really, I’m just ready for the dang season to start! Do you have MV staying in the pits chugging suds? We’re talking motoGP, not WSBK. Maverick Vinales, hence “MV”. KTM has Red Bull’s billfold, so they’ll get better this year, than most expect. I’m betting Tech 3 will go KTM next year as Red Bull wants JoZo in their camp. Just like any sport, participating at the top level takes time/money/patience and these companies are neither the same size nor do they possess the same resources. Yes, I agree with most of that, with Suzuki hopefully returning to group two instead of playing in the rear grid. Yamaha still seems to have issues with race pace simulations, Losail excepted though it had always been a strong Yamaha track. I hope they have their bikes sorted for the season start. Zarco is running some screaming laps, but he says he has also been a little disappointed with race distance simulations. The Hondas and Ducatis seem to offer the most consistent threat overall, but then by the end of testing last season, most people were already proclaiming the end of Marquez’s reign, to be usurped by another young, fast Spaniard on a newly acquired Yamaha. So who knows? It is a tough call this year. Marquez remains the favorite. I’m not sure Dovisioso will present the same challenge to the throne he did last year, but I hope he does. I actually think Pedrosa has a better chance for the number 2 spot. Heading into this season, I would position Marquez and Dovi as the clear favorites. No surprise there. In the second group I would place the three Yamaha riders, in no particular order. After those five guys, there is a large drop off to Dani, Lorenzo, and Crutchlow, followed by Rins and Iannone. No one else will be a major factor, although Petrucci and Miller will be threats for a few podiums, especially in the wet. As the season progresses, I expect one or more of the Yamaha guys to jump into the fray at the sharp end of the points chase, joining Marquez and Dovi. Zarco will achieve Tech 3’s first-ever victory, and possibly more than just one, but when all is said and done the obvious choice for the championship will again be Never Gets Hurt Marquez. VLJ so you are saying Pedrosa, Lorenzo or Crutchlow will finish no higher than 6 th in the Championship? I’m saying the top five contenders to win the championship are Marquez, Dovi, Vinales, Rossi, and Zarco. I don’t expect all three Yamaha riders to prove to be equal season-long threats, but I expect at least one if not two of them to join Marquez and Dovi as the only real contenders to win the title. Beyond those five riders, the next group consists of Dani, Lorenzo, and Crutchlow, all of which may win a race and prove to be a threat on any given weekend, but won’t represent any real challenge to win the title. Dani is simply not a threat to win the title. He can’t beat his teammate on anything close to a consistent basis, and if you don’t beat your teammate you aren’t winning the title. The same holds true for Lorenzo, who will not prove consistent enough to beat his own teammate, never mind Dani’s. Crutchlow? He’s fun, he’s fast, and he crashes far too often. He also finishes outside the top five far too often to be a true title contender. Besides the two obvious guys at the top, it’s down to the three Yamaha riders. The Yamaha isn’t going to struggle all season long. They will make strides, and certain tracks such as Losail are simply Yamaha tracks, just as certain tracks are Honda or Ducati tracks. The issue with the Yamaha riders will be a lack of consistency; that, and each of them constantly taking points from the other two. Marquez and Dovi won’t have to worry nearly as much about that problem. As for who ends the season in fourth, fifth, and sixth place, who cares? I’m merely ranking the title contenders. If one of the top five contenders falls out due to injury and/or DNFs and ends the season in seventh place, who cares? Wow! On the third day eleven riders were all in the 1’54″s. This could be a close season among several riders/brands. I’m liking where this is going. Cmon Qatar!